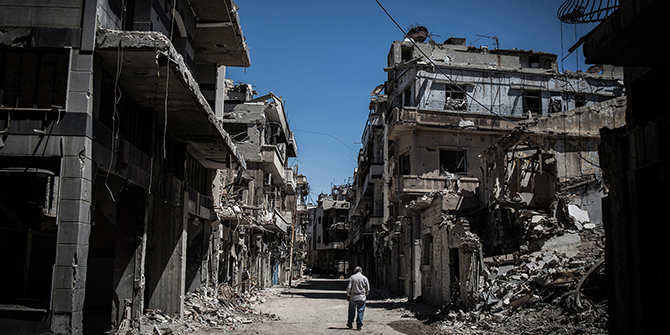 More than four years of devastating violence in Syria have to come to an end. However, peace in Syria can only be reached through negotiations between all relevant parties. The talks will have to include the Assad regime. Since airstrikes have begun, attention in Syria has turned to another actor: Putin's Russia. Niklas Kossow and Ilyas Saliba argue that inclusive diplomacy without preconditions is the only way forward. With hundreds of thousands dead and millions of refugees at Europe's borders, European and US leaders have finally realised that the war in Syria has to come to an end. However, a solution is nowhere near, with parties on all sides of the conflict seemingly unable to hold a constructive dialogue, and with EU foreign ministers unable to agree on a clear strategy for the conflict. While the world faces an ever-growing number of crises, the relationship between NATO and Russia has never seemed more precarious. To the most pessimistic observers the prospect of a direct war between Russia and the West appears to be more than tangible, as was illustrated by Turkey's request for more anti-missile systems at its border at the ad-hoc NATO summit in Brussels this week. Needless to say, tensions were growing long before the Russian-Iranian intervention in Syria. The Russo-Georgian war of 2008 was the first symptom of what many referred to as renewed Cold War. While an EU-sponsored report later found that neither side could be blamed for unilaterally causing the war, it left a wound in Western-Russian relations that even the 'reset' under Obama and Medvedev could not entirely heal. The relationship worsened even further in the context of the Ukraine crisis and the Russian annexation of Crimea. Once again, communication channels, including the NATO Russia Council were closed off. In Russia's eyes, the West was supporting regime change in a country within their perceived sphere of influence. For the Western governments, on the other hand, Russia showed itself unwilling to accept the democratic choice of the Ukrainian people, and with the annexation of Crimea, it broke one of the biggest taboos of international relations: the invulnerability of borders in Europe. In this light, a solution to the war in Syria is crucial not only for the future of Syria, but also for the future of global security beyond the Middle East. This has the potential to be a turning point for NATO-Russian relations and could lead to either a further deterioration or a rapprochement. It will determine whether the confrontation will continue with threats and military build-up or whether a return to diplomatic exchange and pragmatic discourse on the world's most pressing crises is possible. Many observers argue for a no-fly zone in Syria in order to protect civilians in populated areas from arbitrary airstrikes with missiles and barrel bombs. According to a study conducted amongst Syrian refugees in Germany, these air strikes are the most important reason for Syrians to flee their homes. However, there are different ways to reach such an agreement. Of those, the military option is by far the least attractive one. With Russian and Syrian fighter jets in Syrian airspace, as well as ongoing strikes by the US-led coalition against Da'esh (or IS) and other fundamentalist groups, an agreement on who is allowed to target who seems unlikely. As the targets of Russian air strikes in many cases seem to have been opposition forces other than Da'esh this seems to be even more the case. Any further military option that is discussed in the capitals, from Warsaw to Washington DC, is likely to increase tensions and worsen the situation for the Syrian population, unlikely to lead to a peaceful solution. Cooperation with Moscow and Tehran is as necessary as including the Assad regime in talks for a diplomatic solution. The problem with a diplomatic approach has been the different pre-conditions that actors have imposed on negotiations. So far no one was able to bring all actors to the table. Realistically, a diplomatic solution has to include Bashar al Assad, which is hardly acceptable for the West. Currently, the Russian leadership has committed itself to keeping Assad and what they call the ' legitimate government of Syria' in power. With Russian involvement in the war, however, there is no way past the Putin government. While in the current diplomatic climate, this makes reaching a solution harder, it does not make it impossible. The negotiations on the Iranian nuclear facilities show that even with high tensions, it is possible to have a constructive dialogue between the US, their European partners and Russia. The recent meetings between Barack Obama and Vladimir Putin, as well as between Sergey Lavrov and John Kerry have showed that dialogue is still possible. After Vladimir Putin announced the deployment of Russian forces in Syria, experts on Russian politics began the usual round of tea leaf reading to determine what the motives behind this campaign are, both internationally and in the context of domestic politics. While the task of understanding Russia's foreign policy seems increasingly daunting, there is one constant that is running through it ever since Putin took power: the desire to be taken seriously as a partner on an equal footing. Since last week, it has been clear that there is no way around Russia, if EU and US leaders are serious about ending the war in Syria. It is unlikely that the Russian leadership will insist on Assad staying in power in the long run. However, pointing to the turmoil in Iraq and Libya, they will ask for a plan on how to keep Syria stable and ensure it does not become a hotbed of international terrorism (which it has already become in parts). If the pre-condition of removing Assad is taken off the table, there is room for negotiations, including talks about the composition of the future Syrian leadership, which does not have to include the Assad family. After all, the interests of nearly all the relevant global, regional and domestic actors are aligned on the minimal consensus of creating a stable post-conflict order and ending the atrocities of war. Furthermore, all agree - at least on paper - that defeating the terrorist groups that are roaming through Syria and Iraq, such as al-Nusra and Da'esh, is a primary concern. Any international coalition against Da'esh has to include Russian and Iranian forces under a robust UN mandate. The next step has to be to include local partners such as the Kurds, the Syrian Army and moderate Syrian opposition forces in this fight against Islamist fundamentalism. Together with the US, Russia, Turkey, Saudi Arabia and this time also Iran, the EU has to set up renewed diplomatic efforts in order to get both regional and domestic parties together at one table. The more difficult task, however, will be to decide which domestic Syrian actors should join the talks. An inclusive approach to talks, reflecting the realities on the ground with all fighting groups (Syrian Army, FSA, Kurds, other opposition forces, Hizbollah) besides the terrorist organisations Da'esh and al-Nusra, whilst on the other hand not marginalising non-military groups, such as councils and civil society.is the only way to establish a resilient framework for an end to violence. The talks have to focus on immediately ending the violence against the civilian population and securing access for humanitarian assistance. In the medium term, the goals should be a demilitarisation of paramilitary groups and population centres and a united coalition against Da'esh and other terrorist groups. This coalition should be built by combining the international efforts of the US-led coalition with Russian-Iranian troops as well as domestic Kurdish forces, FSA and the Syrian army. In the long run, any negotiations should aim at an inclusive transitional government and potentially a constitutional committee. Whatever the roadmap looks like, the talks will have to be supported by a UNSC mandate calling upon all domestic actors to reduce or cease confrontations for their duration. The war in Syria has been ongoing for over four years. Over 250,000 people are estimated to have been killed and over half the Syrian population has had to flee their homes, according to the UNHCR. There is no time for unilateral action or preconditions. Peace can only be reached at the negotiating table, and the time to talk has come.